What does it to take to make school food healthy? U of M Dearborn's Picasso Cafe. Photo by David Lewinski. You can create the most nutritious school lunch meals, but you can’t make students eat them. That’s the quandary of food service professionals trying to meet federal dietary requirements and feed their customers. Taking direction and inspiration from the Healthy Hunger-Free Kids Act of 2010, school chefs are challenged to create lunches that are much more complicated than in years past. 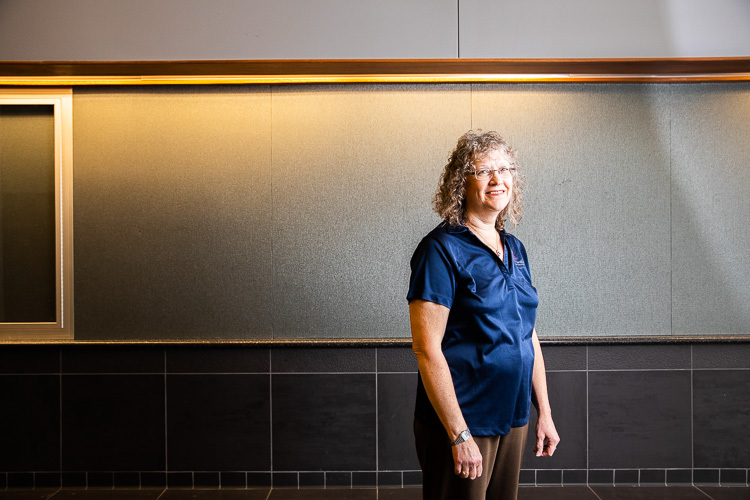 Karen Cummings, food service manager for South Redford Schools through a contract with the Chartwells food service company, says her company has nutritionists, culinary experts, and product buyers who create recipes that meet USDA guidelines, appeal to students, and come in on budget. Ultimately, she says "the challenge is to get the students to want what the USDA has mandated." The Healthy, Hunger-Free Kids Act, the first major reform in school meals and other child nutrition programs in over 30 years, is based on recommendations from the Institute of Medicine and the American Heart Association for addressing childhood obesity and malnutrition. The law requires schools to provide more fruits and vegetables, lower-fat milk options, less sodium and fat, fewer calories, and higher quantities of whole grains. For schools to be reimbursed for lunches provided free or at a reduced cost to students from low-income households, students must take a fruit or a vegetable. "Before 2012, pizza (with whole grain crust) and (low fat) milk was considered a reimbursable meal," Cummings explains. "When they changed the guidelines, they required a fruit or vegetable." Karen Cummings, South Redford Schools food manager with Chartwells, Photo by David Lewinski. Cashiers who notice that the student hasn’t met this requirement will ask, "Are you going to make this a meal today?... If that’s the case, you will need to get a fruit or a vegetable." Otherwise, they pay full price. This didn’t go over well when the program was introduced, Cummings says. There was a lot of waste from students who refused to eat the fruit and vegetables. "For the first couple years, seniors and juniors would be bowling with apples or playing basketball with oranges. There was a whole lot of waste. They should have started at a younger age, to get them familiar with it and then let those who were revolting the most (juniors and seniors in high school) graduate." Healthier school food owes a lot to former First Lady Michelle Obama and the Chefs Move to School program. Chefs like Paul Penney, from Canton, were called to Washington to learn about the challenge of converting school food into desirable, nutritious cuisine. Penney, concerned about what his daughter was eating in the Plymouth-Canton School District, offered his services. Schools were pressured to maintain a minimal nutrition standard for school lunches, Penney says. "All schools were graded and got awards for meeting these standards. You could bring in a chef at no cost to the schools. Some places took advantages of it, some didn’t." Penney, who markets himself as a celebrity chef but also works for charitable projects, was recognized by the White House for his commitment to the Chefs Move to School program. He regrets that the current administration has ended the program. "The chefs are still out there. We don’t get invited back to the schools. A couple of the people I talk to still try to make connections but because the pressure is off the schools... there’s no reason to do it." Will the system change without a federal mandate? "I believe that it’s going to come down to the parents wanting kids to be healthier,” says Penney. “Younger moms and dads who are putting their kids in schools are looking at the lunch programs, and saying, ‘We gotta do better.'" Cummings conducts taste tests and student surveys to promote innovative meals and minimize the risk of failure. She collaborates with Madonna University dietetics students to provide the taste tests. Sometimes she is surprised by student response. "I was shocked that they would like quinoa. They loved it." Why? “Maybe it was the seasoning with had with it. We steamed it, then seasoned it... they liked the taste and the texture." She tried wild rice, but that wasn’t well-received. "We made a garbanzo bean salad with tomato and onion. They’re not into a lot of wet salads, but they like cucumbers and tomatoes…"
Cummings introduced students to various types of pears; green, red, brown. Some had never seen a pear outside of a can. "The interesting thing was, they thought they were apples. Some were reluctant. But as their friends tried it and they liked it, then the ones who refused it the first time would come up to try it." Sustaining dietary habits beyond the school cafeteria is very difficult, especially with low-income families, Cummings says. "Maybe it’s culture, maybe they don’t have access to a produce market with a diverse array of food, and maybe the parents only serve canned pears. Families may think fresh pears are too expensive and wouldn’t even try adding them to the family meal plan." At the University of Michigan-Dearborn (UM-D), the Picasso Cafe needs to meet stringent University of Michigan “MHealthy” nutrition guidelines through its contract with the university. 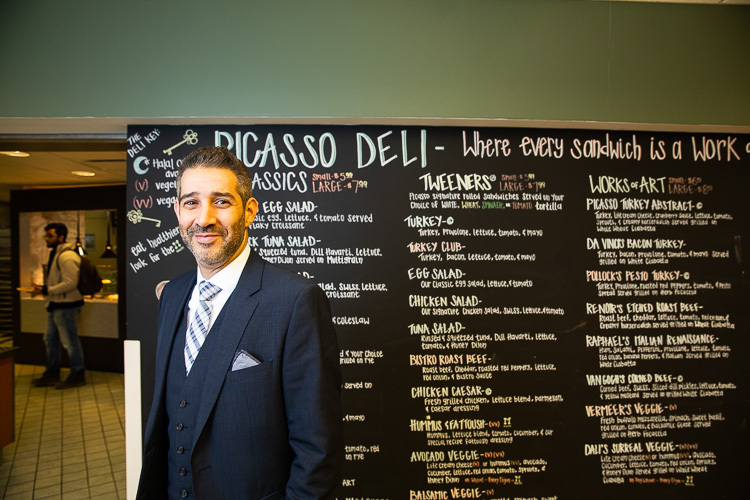 Allen Attee, CEO of Picasso Restaurant Group, is focused on his ultimate customer. "You must offer things that an 18-year old will eat," says Attee. Picasso Cafe won an award in the Healthy Dearborn Healthy Restaurant competition, proving that 18-year olds will eat healthy food. Picasso Restaurant Group chefs develop menu offerings, which are reviewed by U-M nutritionists to attain the "MHealthy" label. About 60 percent of the meals prepared at UM-D achieve that standard. Atte says that some of the group’s menu pursues a higher threshold to achieve a “heart healthy” designation that includes vegan options. But doesn’t mean his 18-year old college consumers are any more enlightened as to the value of well-tempered vegetables. He has to get chefs to buy into healthier options, as well, such as using spices instead of salt and fats for taste. "All those things take more time to develop and the products are more expensive," he says. Which begs the question: Will students pay for good food? "The biggest challenge as business owners is a $5 price point, or a $1 value meal," says Attee. He has to educate students to pay a little more. Doing it right costs more and narrows the profit margin, but Attee believes that it’s essential to his company culture. "It’s very difficult for them to cross the threshold. For a few extra dollars, I’m putting better food in my body. How do you get someone to move to a $10 meal?"